The territory is small (only 10.000 Kmqs), but rich of history and very various, with 4 different longitudinal bands with course north-south. 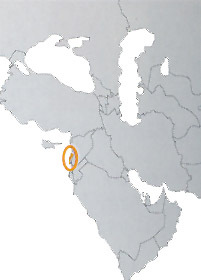 In fact along the sea there is the narrow band level coastline, strongly inhabited with the historical installations in Beirut, Draught, Sidone, Tripoli, to whose shoulders raises the mountainous chain of Lebanon that reaches 3.083 meters msl; separated from the fertile valley of the Beka'a by the chain of the Antilebanon, that races along the syrian border. Practically Lebanon is under the military control of Syria and this currently makes it a kind of non official syrian protectorate. In the part north of the valley of the Beka'a rises one of the world archaeological wonder: Baalbek, with its gigantic temples.